AndroiDTV: Freeview TV for your Android tablet! PCTV Systems AndroiDTV 78E is the easiest way to watch Freeview TV on your Android device. This plug and play Freeview TV tuner is easy to set up and brings you Live Freeview TV wherever you are. With our TVCenter Android application, you can also record your favourite TV programs to your Android device, and then play back those recordings anytime! Busy all day? No problem! Set your Android phone aside and let our TVCenter Android app record your TV programmes. Watch them on your Android device when the time suits you. AndroiDTV is the perfect product on the go! Follow a simple four step process and you’ll be watching Freeview TV in no time. And as long as you have access to a Freeview TV signal, you'll have live TV with you at all times. Download the FREE TVCentre for Android app from the Google Play store. Next, plug in the AndroiDTV TV receiver into your Android device, open the PCTV TVCenter app and follow the on screen instructions. After you scan for Freeview TV channels in your area, you can start watching and recording high quality digital TV on your Android device. It’s that simple. And you'll be able to enjoy your TV programmes on your Android device without using your 3G data allowance. PCTV Systems AndroiDTV has no subscription costs. You simply pay for the AndroiDTV device and then watch and record Freeview TV anywhere. Even better is that AndroiDTV doesn’t use your mobile data plan allowance. The TV Tuner and aerial built into AndroiDTV picks up the DVB-T Freeview TV signal, never using your 3G data allowance. The TVCentre for Android app (available from the Google Play store) has a built in EPG (Electronic Program Guide) so you can plan or schedule TV recordings onto your mobile device. Or use the EPG just to check what’s on Freeview TV next. Take the PCTV Systems AndroiDTV 78e with you wherever you go and have TV in your pocket. Connect and catch up on your favourite TV shows when you are out and about or watch something you have pre-recorded. It’s up to you. PCTV Systems AndroiDTV uses the latest and best quality TV tuner chip technology to ensure crystal clear images and the best signal reception, even in remote locations. The latest technology allows PCTV Systems AndroiDTV to only measure 33mm (L) x 10mm (D) and 29mm (W) so it’s small enough to take anywhere. This state of the art technology also ensures quick channel changes and easy navigation through the settings, channel listings and on screen help menus. Use the PCTV 78e on Windows, too! The PCTV 78e can also be used on a Windows PC. We include the latest TVCenter application for Windows 8 and 7. A USB adapter cable is also provided so you can plug the 78e into a standard USB port on a laptop or desktop PC. Freeview DVB-T tuner for your Android tablet or smartphone. 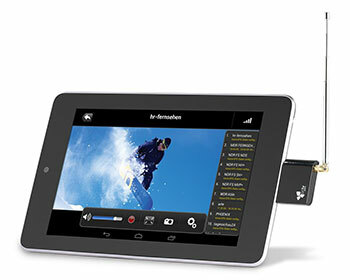 TV tuner plugs into a micro USB port on an Android tablet or smartphone. Watch and record Freeview TV. Playback your recordings anytime! Download the free TVCentre for Android app from the Google Play store. The TVCenter app can be used to watch and record Freeview TV, plus includes an Electronic Program Guide.